Cool and Spicy » Happy Valentine’s Day! .-= lostty´s last post… Happy Valentine’s Day! =-. Happy Valentine’s Day to you too. .-= Smithy´s last post… The despair of Kinoshita Hideyoshi =-. 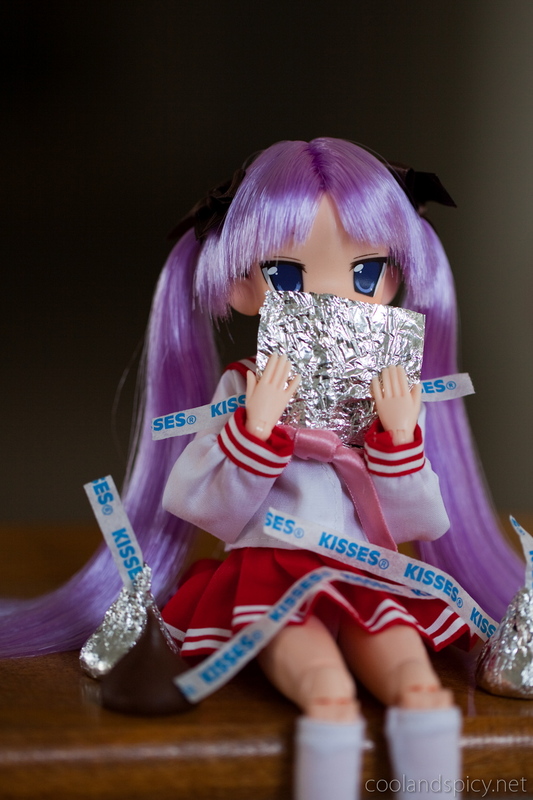 Is Kagami eating Turd Shaped Chocolate? Who in the world makes Turd Shaped chocolate???? Nooooo >_< They're Hershey Kisses. No Hershey Kisses sold in Germany? They're not the best chocolate but they're still popular here. And yeah, coming to think of it, Kisses are remarkably turd-shaped >.> Just that when we eat them, they’re comparatively small enough for us not to make that connection… And they actually taste normal-bad imo, but I guess their unique shape really nets the buyers. Otherwise, they are mediocre chocolate and I wouldn’t have gotten them.